This menu is for the people who have been members of RHCP in the past; the information for each one will vary according to what additional material we have available for each member- any group RHCP interviews from magazine scans can be found in the Magazine Scans/Articles which are arranged chronologically. Unknown source/date : Hillel Slovak article. Interview with his mother and with James, his brother. Interesting for background information (very against Anthony Kiedis). 2015 May Premier Guitar Five page article on Hillel. 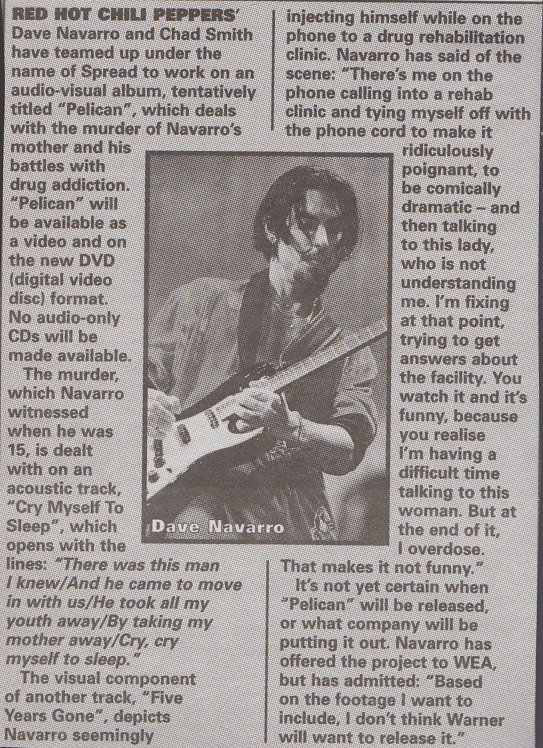 Spread ‘Pelican’ Article about Dave Navarro and Chad Smith working on an album. 1996 Guitar One Article about Dave’s technique. 1998 February Total Guitar (40) Feature on Dave Navarro’s playing style with sample tabs.